The inspiration for Bicyclebungee came from Patrick Meffan, a super-fit competitive cyclist who, on the weekends, simply wanted to enjoy a good cycle with his family. 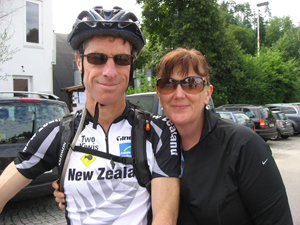 Patrick has spent much of the last 35yrs involved in competitive endurance sport. He has represented New Zealand in both the World Cross Country Championships and the World Mountain Running Championships. More recently he has competed successfully in National mountainbiking competitions, finishing 3rd in the 2009 Vet 3 National Mountain Bike Championships and also winning the 50-54 Xterra New Zealand title. 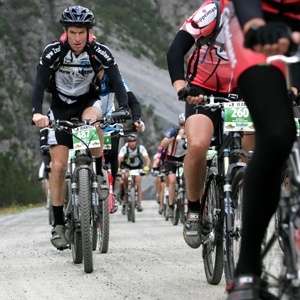 In 2008 he completed the 2 man, 8 day, Transalp Mountain Bike race across Europe - arguably the toughest mountainbike stage race in the world. So you can imagine the frustration Patrick experienced when he simply wanted to share a casual, sociable bike ride with his wife Wendy, his 4 boys, or his non-competitive friends, yet he still wanted to feel like he had a good ride. What initially started out as an idea that would allow him to treat any ride as a training ride, soon became all about companionship cycling - where the slowest rider in the group was able to keep up without feeling guilty about holding everyone else up. The surprising result was that both riders felt they had a good, enjoyable, unimpeded workout together. The final refinements came with a self-stowing system that kept the bungee cord out of the bike’s running gear, and a simple clipping device that allowed the Bicyclebungee to be attached and unattached while riding. The final testing ground for the Bicyclebungee was on the hilly roads around the Croatian Islands in September 2009 in the week of recovery after the World Masters Mountain Running Championships. To the envy of the others in the tour party Patrick and Wendy shared a 400km sociable ride, something that previously had never quite been able to happen, and confirming the rewarding experience Bicyclebungee offers.